Yet as I explored His teachings more deeply, I found that He is also a Master of advaithic philosophy, and a strong exponent of the jnana path (the path of Atmic wisdom). “The main aim of human life is to acquire the knowledge of the Atman. This is the true Purushartha [goal of life]. Human life will find fulfillment only if this goal is attained.”1 The various approaches are beautifully balanced in His discourses, with devotion and Atmic abidance given equal importance. I am God! I am God! I am not different from God! I am the eternal undifferentiated Absolute! Grief and anxiety cannot effect me. I am always content. Fear cannot enter me. I am Satchidananda! I am pure Existence, Knowledge and Bliss. I am Omnipotent! I am all-powerful; nothing is impossible for me! there is nothing which is not known to me. I am Omnipresent! I am present everywhere. I pervade this universe! I am Krishna! I am Christ! I am Buddha! I am Sai! I am Sai! I am Sai! I am God! I am God! I am God! 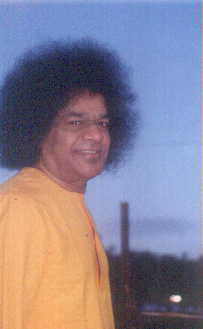 1 Guru Poornima Sandesh (a discourse by Bhagavan Sri Sathya Sai Baba, given on July 28, 1999 at Prashanti Nilayam); Sai Towers Publishing, Bangalore; p. 2.